Long after the final bell has sounded, teachers have plenty of things to take care of and get done. Staying on top of everything a teacher is responsible for can be a daunting task, but the teacher checklist template from Microsoft can quickly become an educator’s best friend. With the Microsoft teacher checklist template, you’ll never forget about an important duty again. 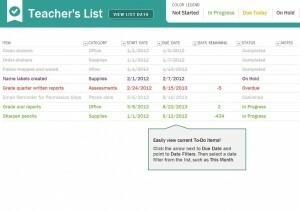 The teacher checklist uses a color coded system to keep you up to date on everything you’ve set out to accomplish. Teachers will also fall in love with another aspect of using the template: You can download the Microsoft teacher checklist template instantly for free courtesy of ChecklistTemplate.net! The Microsoft teacher checklist template comes formatted with easy-to-read text and a beautiful color scheme. However, both the text and colors can be changed if so desired. The scheme can be altered to match that of your school or learning institution. Microsoft makes the customization process for the teacher checklist a breeze! Inputting information in the teacher checklist template is very straightforward. First, add the item or task that needs to be completed. Next, select the category for the item or task. The next step is to add the start date and due date. Doing so will automatically calculate the number of days remaining to complete the task, as well as the status of the task. You can add any necessary notes about the task in the final column of the teacher checklist. The Microsoft teacher checklist template is one of several helpful tools available for teachers, educators and administrators on this site. Feel free to pass along any of these templates to your co-workers or download as many as you need for yourself!